The PX3 competition is one of Europe’s largest photo prizes, despite being only a decade old. 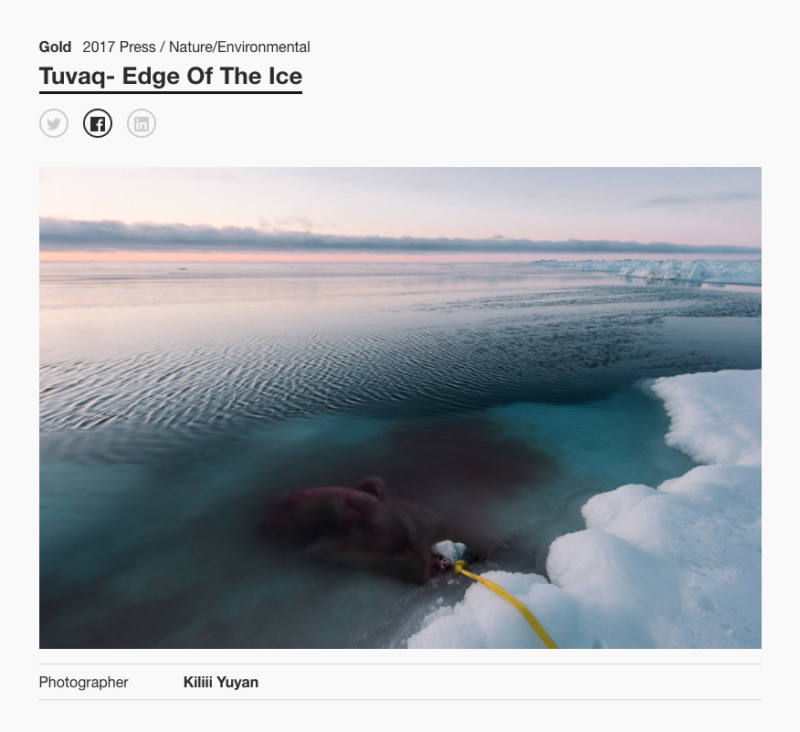 This morning as I was logged into the PX3 website to enter for 2018, I made a surprising discovery– that my work Tuvaq, had won the Gold award in the Press and Nature/Environmental category for 2017. I suppose their email notification had disappeared into my junk mail box? 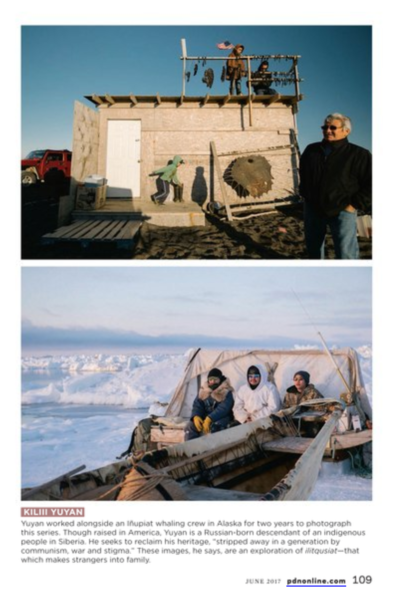 This edit of images from People of the Whale has a distinctly fine-art perspective, and is a look at what sights and sounds you encounter when living on the sea ice in Arctic Alaska with the Iñupiaq. Quyanaq for looking. Lens Culture, now a decade old, has transformed from an award to an authoritative magazine on contemporary photography. It’s an honor to be featured there. Author Gina Williams delves into my photography and recent story ‘People of the Whale’ to find out more about what made it happen and what it’s all about. The German Magazine Spiegel has done an interview on my recent project, Living Wild. 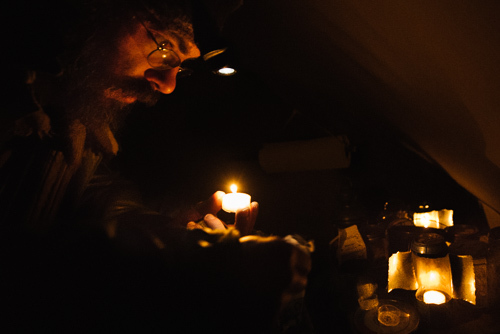 A group of Americans want to live in the Stone Age to be a part of the wilderness. Photographer Kiliii Yuyan accompanied them. But it’s not for the average adventurer– the project is really hard. Yueyan is already for more than 15 years of the group. In one of the last expeditions, the photographer took his camera. The photo series “Living Wild” are crisp glimpses of a life without the comforts of civilization. And, yes, they look in their stone-dresses as the wildlings in “Game of Thrones”, Kiliii Yueyan has heard this before. SPIEGEL ONLINE: Once a year, unplug and your colleagues to Stone Age clothes, go into the wilderness and live a few weeks as hunter-gatherers. Why? Yueyan: When I started 17 years ago, I was looking for my roots. My ancestors are Siberian natives who still live very secluded and in harmony with nature. SPIEGEL ONLINE: How have you been? Yueyan: What I have learned over the years is, above all, how many things we have forgotten about living together with nature. What is good for you, what is bad? How do you do a piece of forest floor to your sleeping place? I am a long time part of the project and now a pretty good hunter. But compared to someone who would be really grown up in a wild culture, I am perhaps at the level of a ten- or twelve-year-olds. SPIEGEL ONLINE: What do you still always driven in the woods? Yueyan: If I go out and try to live by nature, I’m just learning to appreciate how easy things are today; about as simple comforts of water coming from the tap. In the wild, there are things that are hard to get in our world: For example, clean water that had not been clarified previously. Or a fresh salmon. So a salmon, which is fresh, because you caught him up in the river and has prepared a few minutes later on the fire. SPIEGEL ONLINE: It sounds nice. But judging from the brochure of self-discovery trips for stressed top manager. Yueyan: If you start with the preparations, there are already some who expect it is a survival adventure, a battle with nature. But it is the opposite. The idea is to find ways to live together with nature and of nature. Who just looking for a great outdoor adventure, leaving the camp after one, at least two weeks. There is just too hard. SPIEGEL ONLINE: What is so hard? 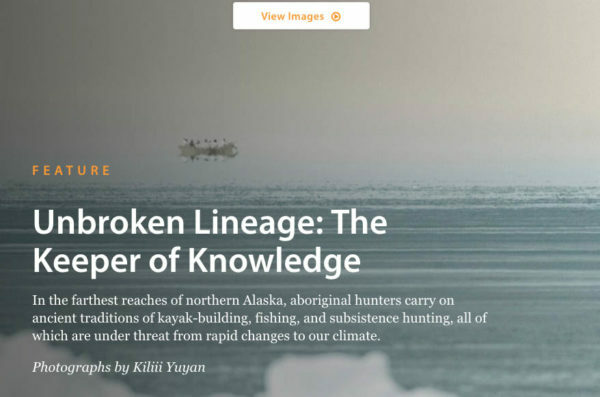 Yueyan: The challenge to survive as hunter-gatherers. Cold, wet, injury, the long distances that one person makes each day – that alone brings a gentle to the absolute limit. But to do the little food that is what makes you ready out there. SPIEGEL ONLINE: What are the meals like? Yueyan: Mainly there are berries or salads from the herbs that we find. In addition, fish and grilled grasshoppers. Roh is the way disgusting. But roasted over the fire, grasshoppers taste great. But it’s hard to be away sick. After about ten days you can feel the consequences: One can not think as good, one is fast dizzy. It is generally more difficult to understand what is happening around you. SPIEGEL ONLINE: hunger to know many homeless people who involuntarily outdoor life. Yueyan: This is an aspect which we are aware. In the beginning when we planned the trip, I offered the story of the “National Geographic”. But one of the editors said, “What I take: There’s this bunch of people who live in the forest, because they have the privilege to which you simply do not see the poor people who live on the road and pull into the forest.. ” Therefore, they have rejected the story. They wanted to kindle no controversy. SPIEGEL ONLINE: And what do you think? Yueyan: To say we live outside like poor people there, not true. In fact, this life is very rich. Rich in time, full of impressions and experiences. SPIEGEL ONLINE: How did an excursion begins so? Agreed to in a parking lot and then go easily together in the forest? Yueyan: No, as a beginner it takes months of preparation. You have to establish yourself and the food that you want to take to prepare, your entire clothes. Because with pre-dried food is your life there a lot easier – at least initially. SPIEGEL ONLINE: So you go in advance to the store and stock up with Stone Age food like dried meat and dried fruit? Yueyan: No, everything has to be collected and dried himself. SPIEGEL ONLINE: That is checked? Yueyan: There are very strict rules, which mitdarf and what is not. Basically, you have to restore it from nature, with Stone Age tools and Stone Age techniques. SPIEGEL ONLINE: But have you doing a first aid kit and a cell phone for emergencies. Yueyan: That’s all not allowed. Part of the idea is to learn to solve problems without the help of modern technology. The last time we had, for example, forest fires on three sides of our warehouse. Therefore, an emergency plan was very important.So we marched twice daily at a nearby mountain and looked to see if the fire had come closer. SPIEGEL ONLINE: And your plan for the real thing? Yueyan: There was a lake nearby. To which we would have run if the fires had trapped us. Yueyan: If we had been waiting in the lake, while the fire everything would have devastated around us. SPIEGEL ONLINE: What are you talking on this trip, anyway? Only about Stone Age theme? Yueyan: Not quite. In the beginning you have to speak a lot about practical things.Where do we go? Where to find water? Where food? Where is it safe? How do we find traces of animals that we can chase? Another dominant theme are sensory perceptions. It really speaks a lot about the smell of things or how they feel. Also because we run all the time barefoot. That’s as much information that we usually no longer perceive. About the smell of cold water. SPIEGEL ONLINE: Sounds pretty romantic and intense. But you have laughed at the question. Why? Yueyan: Because you pretty much about excrement speaks: “Have you relieved there Ah, because I really wanted to sleep?” And: Hardly anything makes the other angrier than having done his business too close to the camp. Feature Shoot showcases the work of international emerging and established photographers who are transforming the medium through compelling, cutting-edge projects. 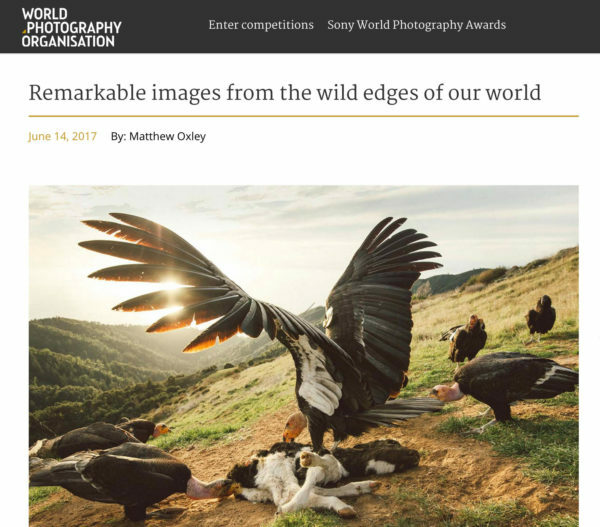 I’m excited they are featuring my project, Living Wild. I just had the pleasure of speaking with Ibarionex Perello, host of the Candid Frame podcast and a well known-street photographer. 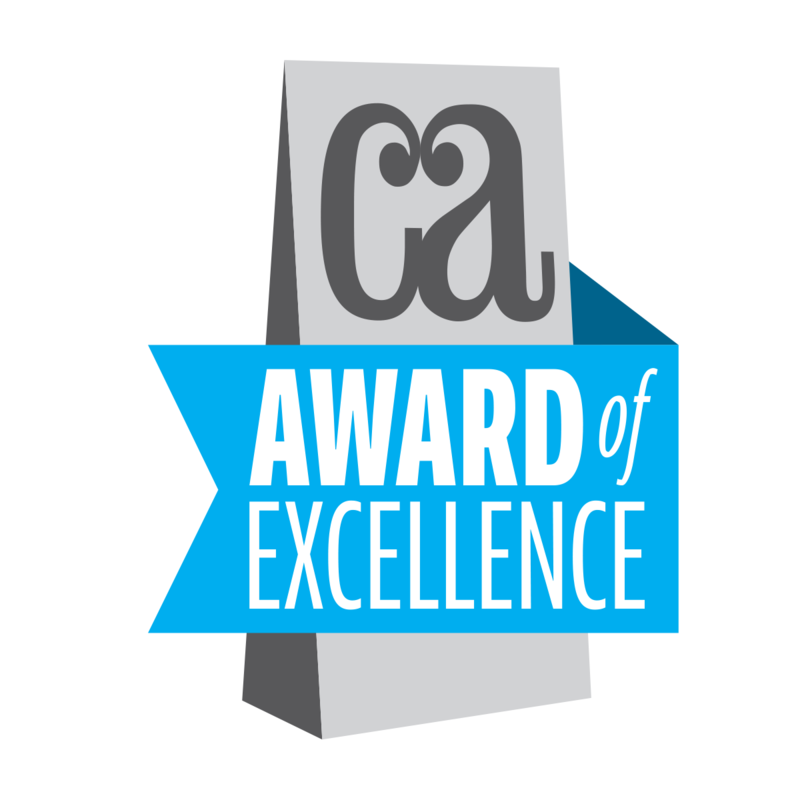 Ibarionex and I were recently co-presenters at the photo expo PIX2015. 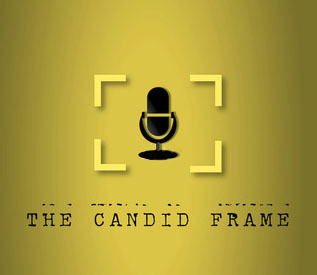 I’m excited to be on the show since I’ve been a long time fan of the Candid Frame, which is really the best podcast on photography out there– it focuses on the art and process of photography rather than gear and technique. 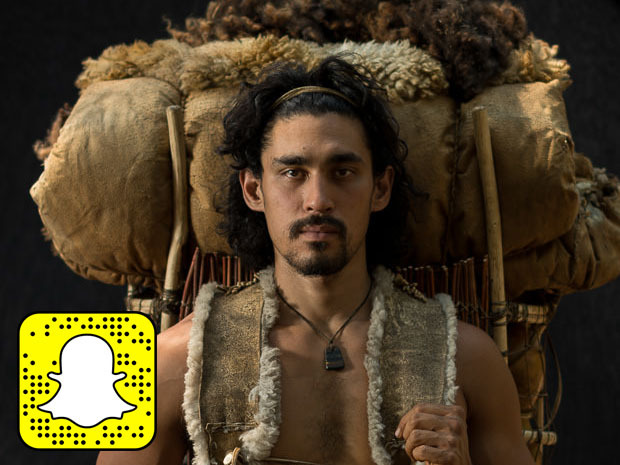 We talked primarily about the Living Wild project, my long-term project on modern hunter-gatherer practitioners, as well as bit about my background growing up as a Native/Chinese kid and learning self-reliance. You can play/download it directly here.